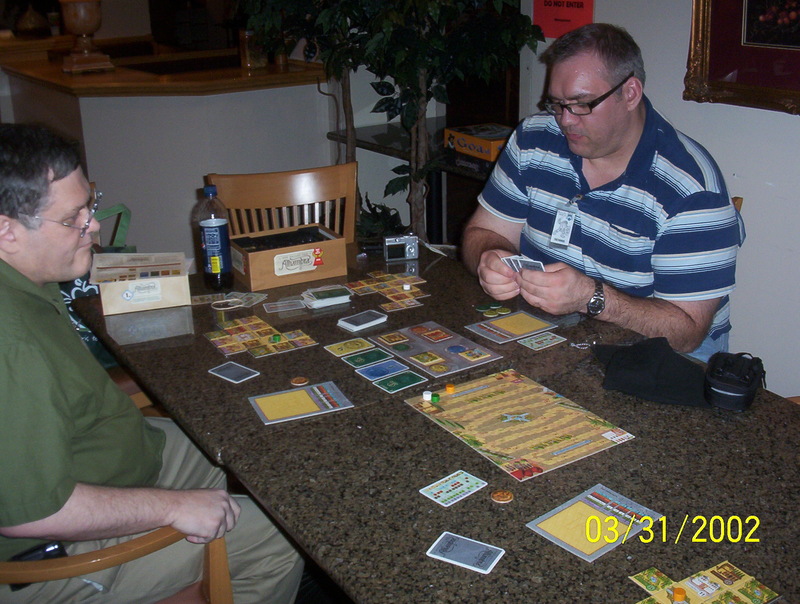 So after Fiasco Chris and I headed over to the boardgame room to play some games. Chris had brought several games with him. While we were deciding what to play, one of Chris’ friends showed up. Jim also had some games. One of them was Alhambra which neither Chris nor I had played. Alhambra is a tile laying game about building the best, most luxurious palace. You buy tiles to put together your gardens and rooms in place. Points come from most tiles of the same color, longest outer wall, and points on the tiles themselves. Chris won if I remember correctly. Alhambra is a fun and thinky game. We both decided that it is on our buy list. By now it was time for me to head out for Savage Saturday Night and some Shiantar action. Savage Saturday Night (SSN) started last year at MACE. Savage Saturday Night is a Savage Worlds event. Lots of different Savage Worlds games run at the same time in one room. It was bigger this year. I think there were about 12 Savage Worlds games going on at once. This year I signed up for Sean Patrick Fannon’s Shaintar: Immortal Legends game. Shaintar is the Savage Worlds high fantasy setting. I got there a bit late. To my surprise there were 11 other players plus Sean. I had been told that Sean likes to GM large games but wasn’t ready for this. So I sat down, got passed a couple of pre-gens to choose from, and away we went. My character was basically Legolas – elven archer extraordinaire. The game was a continuation from an earlier game. So some of the players had gelled pretty well already. I was lucky enough to be sitting next to Sean’s wife (whose name I have forgotten). She helped re-acquaint me with the system. I also announced that at midnight everyone should tell me Happy Birthday. Sean then gave me a birthday present – a golden bennie. He explained that spending the golden bennie would allow something that I wanted to happen to happen, if at all possible. Very cool. We were playing a group ‘like the Texas Rangers’ (not the baseball team the lawmen). The first encounter was on a ship headed to find a magical rock. As the moon appeared we found out that some of the crew were werewolves. The ogre in our group immediately swiped at one in the rigging causing him to drop to the deck, right in front of me and the priestess played by Sean’s wife. Fortunately (kind of) Ogre’s momentum carried him onto the deck too. He landed between my guy and the werewolf. And Ogre’s attack was gone. The priestess was prepping a spell but I had initiative. So Tok (my guy) climbed up Ogre’s back, jumped off of his shoulder, flipped in the air, and nearly decapitated the werewolf with my two swords. Very cool. I got some high fives for that. And that set the stage for Tok. He assisted in killing one of the other werewolves too. We landed on an island and were greeted by a lot of undead of various forms. I was near the end of the initiative line so I waited and watched as Tok’s comrades took out the bad guys. Ogre was awesome. The guy playing him was really good, playing in character, which was a lot of fun. A couple of bone lords showed up and things started to look bad for us. But Tok’s turn came up. He was still in the rowboat. He drew back his bow and landed a head shot on one of the bone lords, piercing his eye socket, killing him. Ogre and a couple of the others took out the other one. We ended up at some ruins where a troll and hobgoblin were asleep in a hut. Our captain sent Tok and two others out to scout out the situation. We discovered some ninja elves guarding the ruins. I stayed put while the rest of the group, in two parties, engaged the ninjas and the troll and hobgoblin. The priestess blasted a magic user that popped up and the rest of group one knocked out most of the ninjas. Ogre and party 2 attacked the hut with the troll and hobgoblin. Ogre actually jumped on the hut, collapsing it on top of the bad guys. By this time some dudes had showed up in the ruins a bit away. Along with… a giant werewolf. The werewolf swiftly attacked Ogre’s group. One of them turned out to be a vampire who attacked me and a crocodile guy on my team after I got another good shot on the necromancer. As the vampire went by Tok, Tok (who had no attack) tripped the vampire. He was not expecting this. He face planted and slid up to the feet of the crocodile guy. Who promptly whacked him enough to allow the priestess to finish him off with her special wood staff. Everyone cheered. It was pretty awesome. Sean then did something I had not seen. We voted for MVP – most valuable player. We all wrote down the names of the three characters that we thought contributed the most to the experience of the game. I voted for Ogre, the guy playing him was pretty awesome. I voted for Sean’s wife for helping me so much. I voted for me as I thought I did pretty good. Ogre won as expected. He got a PDF package of stuff from Onebookshelf.com. And I won second and got a dice bag and some stones from Beautiful Brains. It was fun. That pretty much concludes MACE for me. It was a blast. Can’t wait until next year.